Intelligence Bureau (IB) Answer keys 2017 – Download Intelligence Officer Grade-II Exam Solution: IB ACIO Answer keys 2017 is to be released shortly. Intelligence Bureau under Ministry of Home Affairs has conducted the much awaited examination of ACIO Intelligence Officer posts. 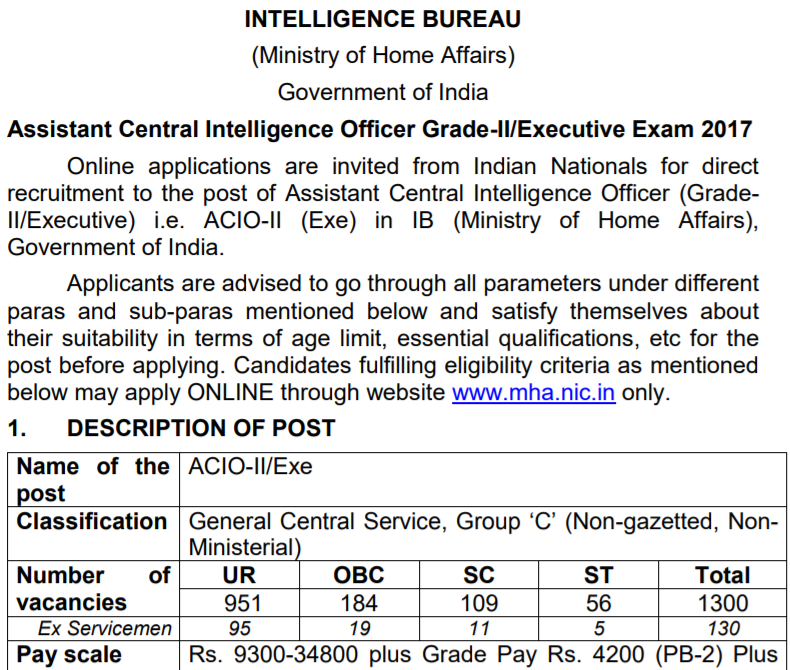 Online applications were invited for filling up 1300 Assistant Central Intelligence Officer (ACIO), Grade-II/ Executive vacancies under General Central Service, Group-‘C in the various Subsidiary Intelligence Bureau, Ministry of Home Affairs, Government of India. IB ACIO Exam Successfully conducted. Selection Process: Candidates will be selected based on their performance in written examination, language test, Stenography Test, personality test, documents verification and medical examination. Pay Scale: Salary will be provided to selected candidates will be as follows; Rs 9,300-34, 800 + Grade Pay Rs 4600. All those candidates who had appeared at IB ACIO Examination for Asst Central Intelligence officer (Grade-II) Posts in Intelligence Bureau, they can now check Answer keys of all questions asked in IB ACIO Examination 2017. Answer keys will be available at IB’s official website at recruitmentonline.in. Log on to IB’s official website at www.mha.nic.in. Navigate to "What's New" Section. Now click on "Job Opening - ACIO-II/EXE 2017" link. Find the link of “Assistant Central Intelligence Officer” and click on it. Click on "Download Answer keys" link. More Details: If you are looking for IB ACIO website to download IB ACIO Answer keys 2017 you may need to read official recruitment notification for more details about IB ACIO Answer keys for Intelligence officer Posts regarding cut-off, result, marks, selection process and Answer keys. IB ACIO Exam Answer keys (Shortly).